Businessman extraordinaire, statesman, peacemaker-just some of the umpteen accolades and depictions which have been used to describe the late former Taoiseach Albert Reynolds. The Rooskey born politician played a key role in advancing the Northern Ireland peace process, typified most memorably by the 1994 IRA ceasefire. 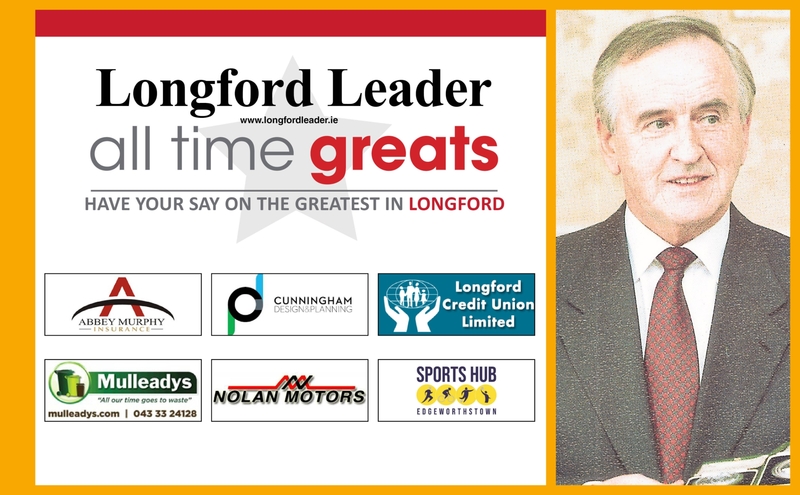 First elected as a TD for Longford when he was 45 in 1977, the Fianna Fáil stalwart led the party in two coalition governments. He was also a very successful businessman with an empire that included dance halls to the pet food industry. Living in Longford for most of his life, he was considered a deal maker and is credited with securing billions of funding from the EU. He passed away in 2014 at the age of 81.